Over the last few months, social unrest has cascaded across the major urban centers of North Africa and the Middle East. Journalists and communications media are often part of such moments of upheaval. Yet this recent wave of unrest is unlike other discrete periods of rapid political change. Through digital media, the stories of success in Tunisia and Egypt have spread over social networks to many other authoritarian regimes. Digital media has not only caused a cascade of civil disobedience to spread among populations living under the most unflappable dictators, it has made for unique new means of civic organizing. During the heady days of protests in Cairo, one activist succinctly tweeted about why digital media was so important to the organization of political unrest. "We use Facebook to schedule the protests, Twitter to coordinate, and YouTube to tell the world," she said. The protesters openly acknowledge the role of digital media as a fundamental infrastructure for their work. Moammar Gadhafi&apos;s former aides have advised him to submit his resignation through Twitter. Yet digital media didn&apos;t oust Hosni Mubarak. The committed Egyptians occupying the streets of Cairo did that. As Barack Obama put it, mobile phones and the Internet were the media by which soulful calls for freedom have cascaded across North Africa and the Middle East. Just as the fall of Suharto in Indonesia is a story that involves the creative use of mobile phones by student activists, the falls of Zine El Abidine Ben Ali in Tunisia and Mubarak in Egypt will be recorded as a process of Internet-enabled social mobilization. It is difficult to know when the Arab Spring will end, but we can already say something about the political casualties and long-term regional consequences of digitally enabled political protest. Newsweek called it Egypt&apos;s "Facebook Revolt"; Fast Company argued "Massive Egyptian Protests Powered by YouTube, Twitter, Facebook, Twitpic"; and American U.N. Ambassador Susan Rice has said, "The power of this technology, the power of social networking to channel and champion public sentiment, has been more evident in the past few weeks than ever before." However, overemphasizing the role of information technology diminishes the personal risks that individual protesters took in heading out onto the streets to face tear gas and rubber bullets. While it is true that the dynamics of collective action are different in a digital world, we need to move beyond punditry about digital media, simple claims that technology is good or bad for democracy, and a few favored examples of how this can be so. Pundits often miss three things about why digital media is important for understanding contemporary social change. First, digital media are social networks. It matters not whether social mobilization occurs face to face over a lunch counter or through a short text message sent by mobile phones. It has become a false dichotomy to describe strong ties as being face to face communications and weak ties as being short text messages. The personal decision to face rubber bullets and tear gas is only ever taken when appeals for solidarity come through social networks. Images of friends and family being beaten by security services draw people into the streets. Increasingly, those appeals come digitally, as wall posts, tweets and pixilated YouTube videos hastily recorded by mobile phones. Second, the significant structural change in how political life is organized is not so much about new connections between the West and the Arab Street, but about connections between Arab Streets. The digital storytelling by average Tunisians is what spread across North Africa and the Middle East. Protesters in Tunisia and Egypt used social media to link up. Telling stories about their shared grievances and sense of desperation became much of the content flowing over these networks. Eventually, such content spilled over the social networks that transcended national boundaries. The cascade effect, however, wasn&apos;t simply that shared grievances spread from Tunis to Cairo. Instead, it was the inspiring story of success — overthrowing Ben Ali — that spilled over networks of family and friends that stretch from Morocco to Jordan. In a sense, there is an important parallel between Obama&apos;s success and Mubarak&apos;s failure. An important part of Obama&apos;s successful 2008 presidential bid was the ability of his campaign to use digital media to connect his supporters to each other. Traditional political campaigns work hard to connect potential voters to a block captain, who is connected to a neighborhood captain, who is connected to a regional director, who is connected to a state&apos;s campaign representative. In contrast, Obama&apos;s campaign treated the links between supporters as important as the connections to the party organization. By facilitating the creation of social networks within the context of his campaign organization, Obama built an agile and responsive organization. 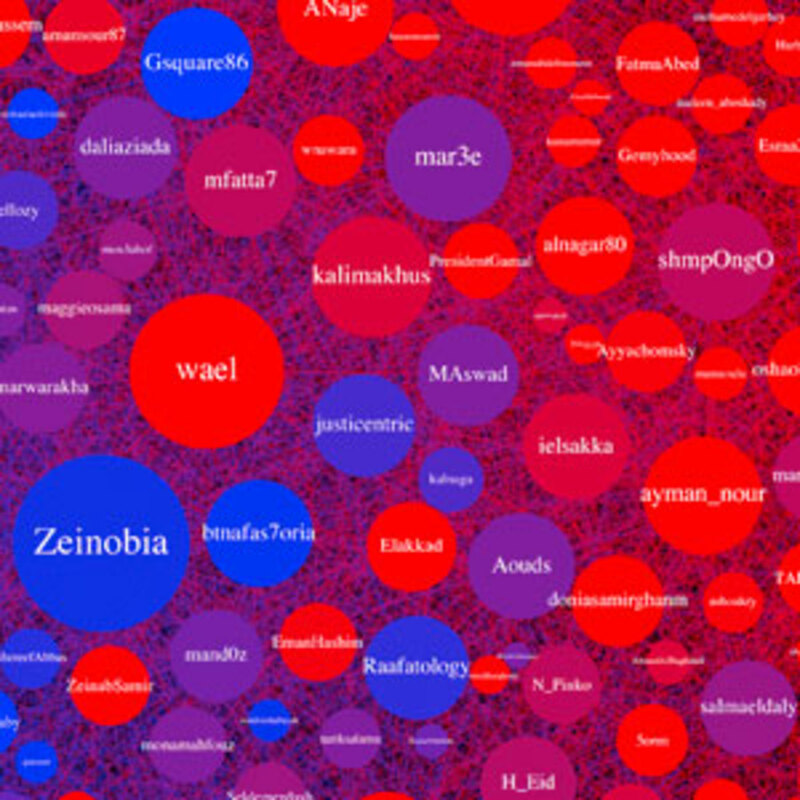 Click this image to see a graphic from kovasboguta.com that visualizes the pro-democracy movement in Egypt on Twitter. Third, the content that seems to have the biggest cascading effect over digital media is personal, not ideological. In most previous social upheavals and political revolutions, there is an ideologically driven opposition that topples a dictator from another part of the political spectrum. Radical socialists, left-leaning union leaders or a Marxist army from the countryside would lead a popular revolt. Or religious conservatives or right-wing generals would lead a coup. But most of the reports from the ground suggest that these rebellions are largely leaderless and without traditional ideological labels. The political parties — and religious fundamentalists — are bit players. Let&apos;s begin with the catalogue of political casualties since a desperate Tunisian shopkeeper set himself on fire, activating a transnational network of citizens exhausted by authoritarian rule. Within weeks, digitally enabled protesters in Tunisia tossed out their dictator. Social media spread both discontent and inspiring stories of success from Tunisia across North Africa and into the Middle East. The protests in Egypt have drawn the largest crowds in 50 years, and the crisis is not over. The discontent has spread through networks of family and friends to Algeria, Jordan, Lebanon and Yemen. Autocrats have had to dismiss their cabinets, sometimes several times, to placate frustrated citizens. Algerians had to lift a 19-year "state of emergency" and are gearing for demonstrations over the weekend. Even Libyan dictator Moammar Gadhafi had to make concessions to activists brave enough to raise street protests against government housing policy, although he&apos;s fighting violently against the final step in the program — his removal. But perhaps the most important casualty in terms of global politics is the U.S. preference for stability over democracy in North Africa and the Middle East. This preference, expressed in different foreign policies, seems untenable when groundswells of public opinion mobilize for democracy. What are the lessons for Tunisia and Egypt&apos;s neighbors in the region? In this global, digital media environment, it is going to be increasingly difficult for the strong men of North Africa and the Middle East to rig elections. It will also be increasingly difficult to suspend democratic constitutions and pass power to family members. In the West, we may not think of these things as significant steps. But historically, closing options for authoritarian rule has been an important part of democratization. Giving a dictator less room to maneuver is as much a part of democratization as running the first successful election. There certainly are other causal recipes. The classic understanding of social mobilization is that it depends on the appearance of collective identities, shared motivations and grievances, and ultimately a change in the opportunity structure for collective action. To greatly simplify one of the most important recipes for democratization over the past few centuries, we might say that well-educated elites leave urban centers, radicalize the communities across the countryside and return in force to seize power. But for the modern democratization recipe, digital media is a key ingredient. What Are the Lessons for the West? First, Islamic fundamentalists may terrorize parts of the region, but a larger network of citizens now has political clout, largely because of social media. The Muslim Brotherhood or its associates are no longer the only way to organize political opposition. Older, ideologically recalcitrant political parties may not even be the most effective way to organize effective political opposition in a digital world. Second, democratization has become more about social networks than political change driven by elites. The U.S. needs to spot when a dictator&apos;s social networks fragment to the point that he is incapable of managing his regime. More urgently, the U.S. needs to take serious note when networks of family and friends align — increasingly through digital media — on a set of grievances that political elites simply cannot or will not address. This means not simply studying public opinion in countries around the world, but studying social networks in countries around the world. It means looking for ways to measure public opinion that assume digital content contains relevant hints about popular sentiment. The techniques and traditions of the polling sciences work with the deep-seeded assumption that a random phone call over a land line to a male head of household will yield a sensible sampling frame. Yet in most of the countries where digital media seems to have a role in political change, these assumptions simply don&apos;t make scientific sense. In a digital era, there must be ways to treat social computing as a means of measuring popular opinion. Finally, what does it all mean for democratization? The Arab Spring has already brought down two dictators. Regardless of whether others fall in the next few days or weeks, terms and conditions for authoritarian rule in North Africa and the Middle East have changed. With even a modicum of outside support, democracy in these countries can be home grown. There are reasons why social scientists loathe prediction. But any serious discussion of cascading effects must answer a key question: When will the Arab Spring end? So far, one way to describe what has happened in Tunisia and Egypt is to say that tech-savvy activists made effective use of social media to catch their dictators off guard, build opposition solidarity and out-maneuver the security services in the "ground game" in a dense urban center. Across the Middle East and North Africa, however, there aren&apos;t very many other countries with similar dynamics. Tunisia and Egypt have the largest number of Internet users. Many of the other countries in the region are not ruled by aging military strongmen, but by constitutional monarchs. Certainly Ben Ali and Mubarak used friends and family to manage extended networks of state assets and political power. But the ruling monarchs of this region have even more extensive family networks. Algeria, Bahrain, Iran, Jordan, Lebanon, Libya and Yemen are all experiencing cascading effects in different ways. All have civil society leaders who have made explicit claims of inspiration from Egypt and Tunisia. But countries with both lots of tech-savvy activists operating in a dense urban center, and a dictator whose social networks no longer provide the command and control needed to match these civic social networks, may be only Iran and Jordan. The West has a significant opportunity to help people across these regions enshrine the democratic norms we value and they seek. The U.S. should issue the right kinds of rhetorical and practical support, such as working hard to keep the Internet infrastructure open and publicly accessible. Several years ago, Secretary of State Hillary Clinton made bold statements about Internet access as a basic right. This notion disappeared because at the time, more basic rights about health and safety deserved attention. But here we see ways in which different kinds of human rights are interdependent. U.S. leadership on keeping Internet traffic open, especially in times of political crisis and when dictators try to disconnect their nations from the global flow of political discourse, is vitally important. Addressing human rights broadly means understanding the ingredients for democratization — and especially digital media. Generation S and the coming humanization of the digital revolution.